Yoga is a centuries-old practice that can help you get your life on track. 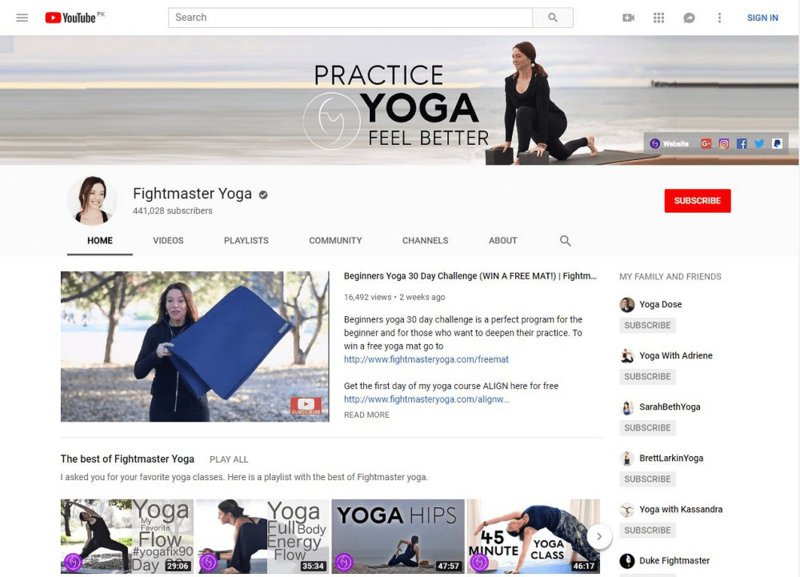 Click here to read all about 15 best yoga channels to learn yoga straight from YouTube! Gone are the days when learning new things required you to cover long distances, sprawl over books for countless hours, or at least find someone to teach you. Today, everything is available on the internet! From playing a musical instrument to bringing out the artist in you by polishing your creative skills, you can learn anything over the internet. In fact, it won’t be stretch to say that in today’s world, the internet has become the hub of knowledge. When it comes to yoga, not only can you find extensive and detailed information about it online but you can also learn directly from the experts in the field! 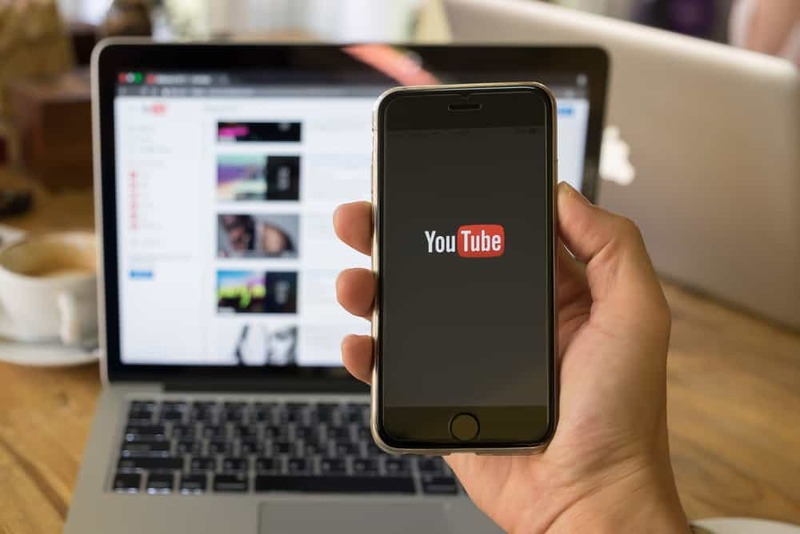 Everyone knows that in the internet realm, YouTube is king, when it comes to videos and channels. Therefore, it does not come as a surprise that a lot of us turn to YouTube channels when it’s time to learn something new and exciting like yoga. 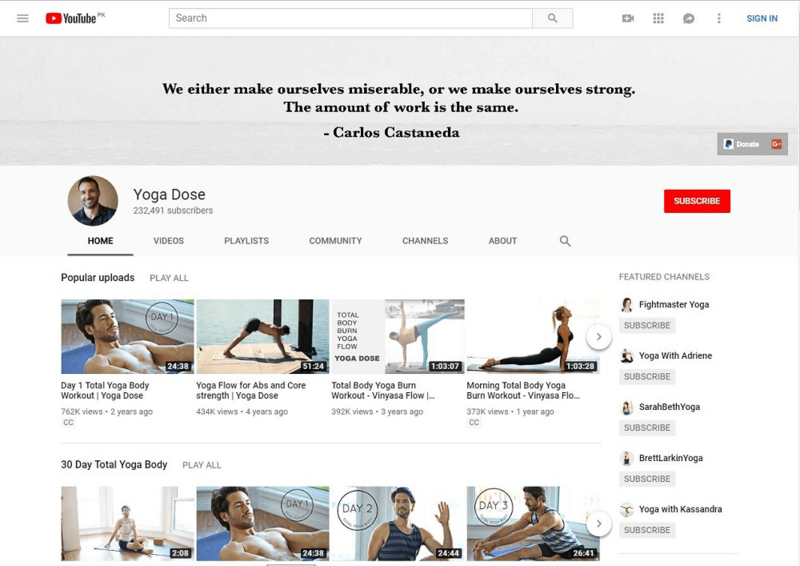 There are a number of yogis out there who love to share their wisdom and yoga techniques with everyone through their YouTube channels. 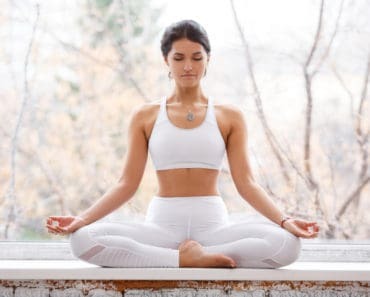 However, in order to learn the best yoga practices that suits your requirements the best, it is important to find just the right online yoga guru for yourself. However, thanks to the number of options available online, picking the right channel to follow in order to up your yoga game may not be as easy as you may have imagined. In fact, it can be quite overwhelming! 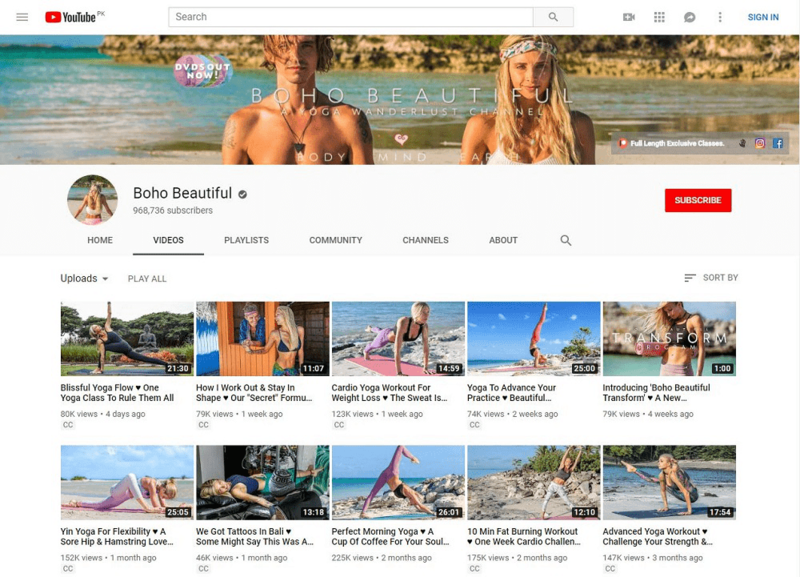 To help you make this crucial decision, we have compiled a list of some of the best Yoga YouTube channels. Scroll down to check them out and follow the ones you like the most! 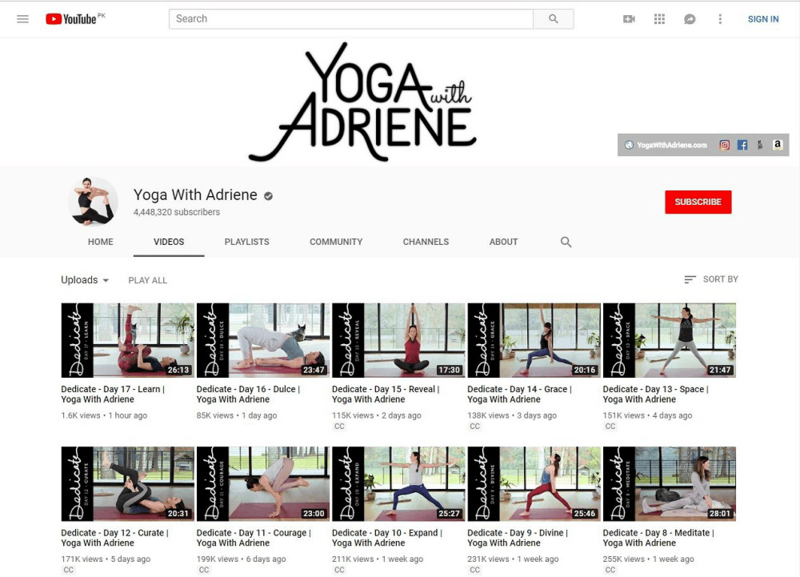 Yoga With Adriene is fairly popular in the yoga community of YouTube. The best thing about this channel is that it has something for everyone! Whether you are already a pro at yoga or are just starting out, you are guaranteed to find something new and interesting here. Yoga sessions by Adriene are all about creating your space, cultivating self love, making time for yourself, connecting with your true form, healing, and having fun. If this is what you are looking to get out of yoga, you may want to check out Yoga With Adriene. Do you think you are lacking inspiration in your life? Well, not anymore! Because all the content available on Boho Beautiful is created in hope of inspiring people all over the world. The channel is a result of the combined efforts of Juliana and Mark. Both of them are equally knowledgeable and devoted to yoga, the passion of their lives. Lesley Fightmaster aims to make your life better through yoga. She has a firm belief in the healing powers of yoga and guarantees that you will feel better, even if you regularly practice yoga only for 10 minutes! 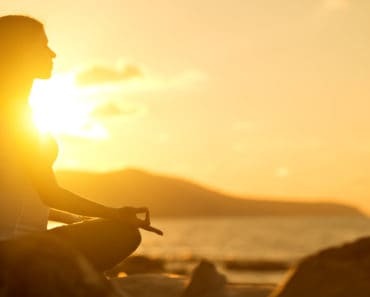 Her ideology behind Fightmaster Yoga is that whether you are depressed, overweight, stressed, overwhelmed, or generally unhappy, yoga can transform your life into a happy and healthy one. If you are a beginner, it is advisable to check out the beginner’s yoga checklist. Try the Atha Yoga Happiness Program or Yogafix90 to uplift your mood and lead a generally happy life. You can also enjoy the Detox yoga, Morning yoga, Ying yoga, yoga for weight loss, Vinyasa yoga, Ashtanga classes, and much more! 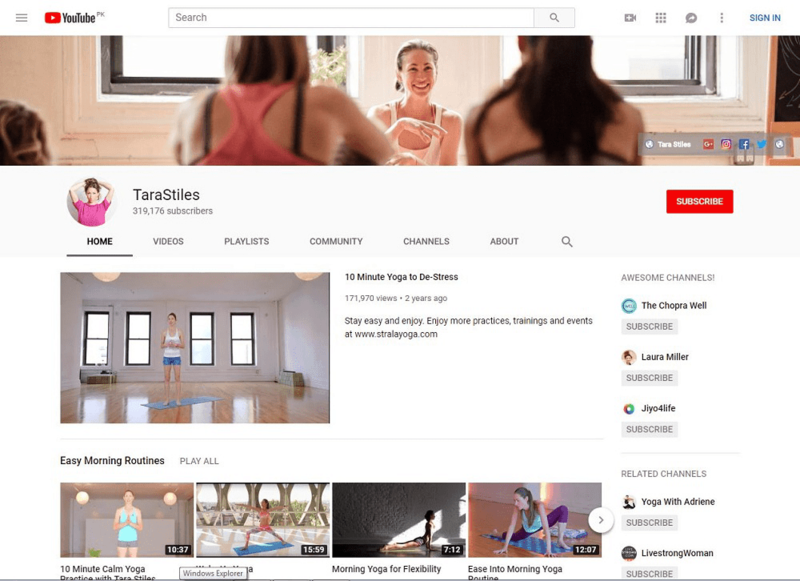 Back in 2007, when Tara Stiles started her channel, she had only one goal – to help her friends and family connect with themselves and enjoy their lives in the purest form. Over time, her channel has grown into a community! Tara Stiles’ yoga sessions helps you slow down and take a moment to yourself, stay relaxed and enjoy every move and posture to the fullest. She posts around 4 videos per month so you can enjoy new videos each week. Sara Beth Yoga is where you get your weekly dose of yoga! Sara uploads, more or less, one video every week. 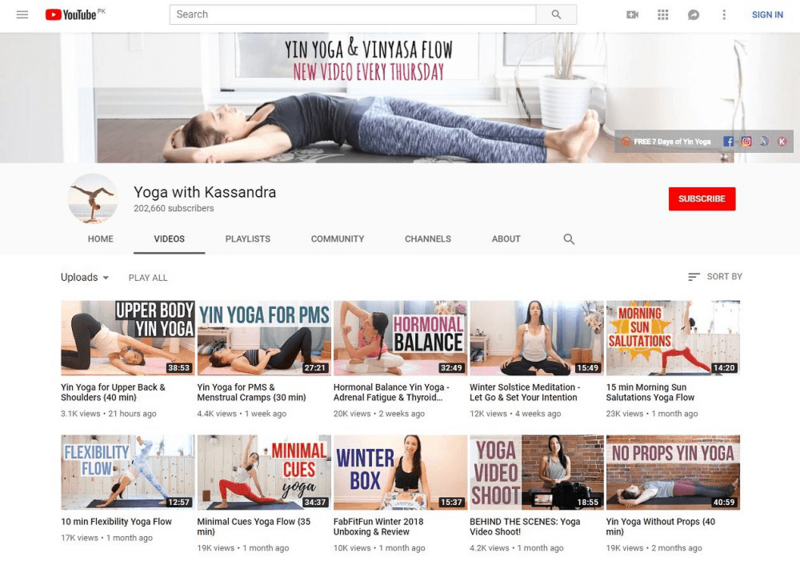 Her videos encompass a wide variety of content including 5 – 30 minutes long videos on Power yoga, Hatha yoga, Postnatal yoga, Prenatal yoga, Yin yoga, Restorative Yoga, Meditation, and Health and lifestyle. You can enjoy these inspirational yoga videos to experience a variety of positive effects in your life. If you are a beginner, it is advisable to get started with the “Month of Yoga” practice! If you are looking for a diverse yoga experience, the DoYouYoga community is exactly what you need. It allows you to learn and enjoy yoga from certified yoga instructors from all around the world! 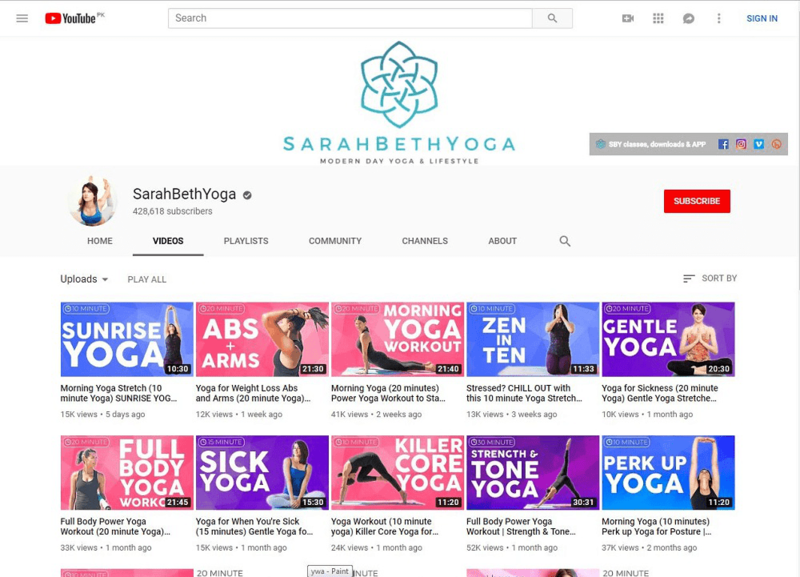 This means that you can surely find every style of yoga on this channel. It is the hub for all your yoga practices. In fact, it won’t be wrong to say that DoYouYoga is the right place to satisfy the cravings of your inner yogi. 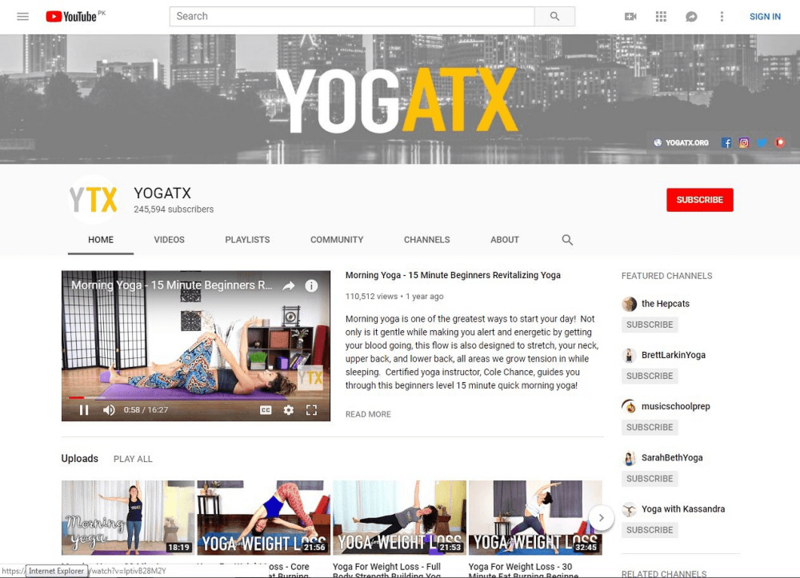 YOGATX joined the YouTube community in 2013. Their videos are usually filmed and produced at the YOGATX studios in Austin, TX. Every Tuesday, the team comes up with a new video to help viewers all around the world take their yoga game to the next level. You can enjoy videos from some of the fairly popular certified yoga instructors, including Cole Chance, Jen Hilman, Lauren Bringle, Savannah V., Jacq St. Pierre, & many more! 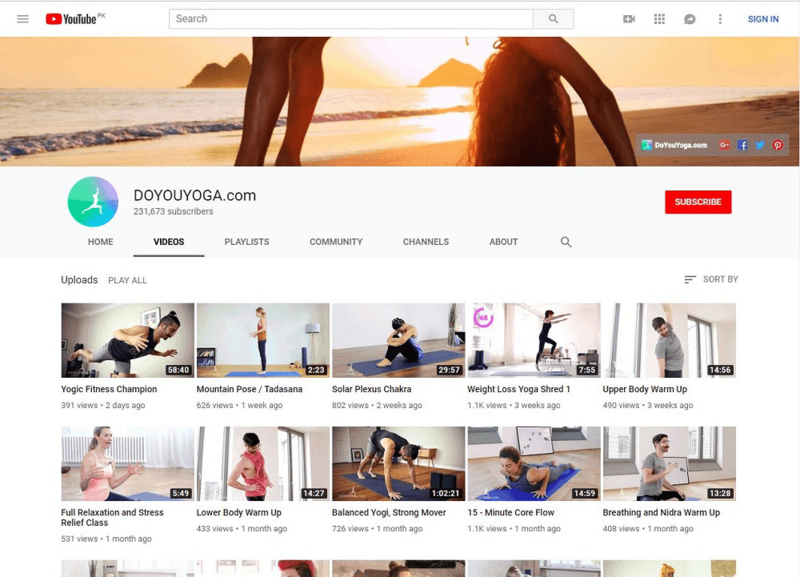 An interesting thing to note is that in most of their videos, team YOGATX is focused on providing simple and easy-to-follow instructions in a manner that makes the viewers feel like they are attending a private yoga lesson. This makes it really easy and fun to follow their instructions and learn yoga from scratch! Yoga By Candace has made a name for itself in the yoga community. 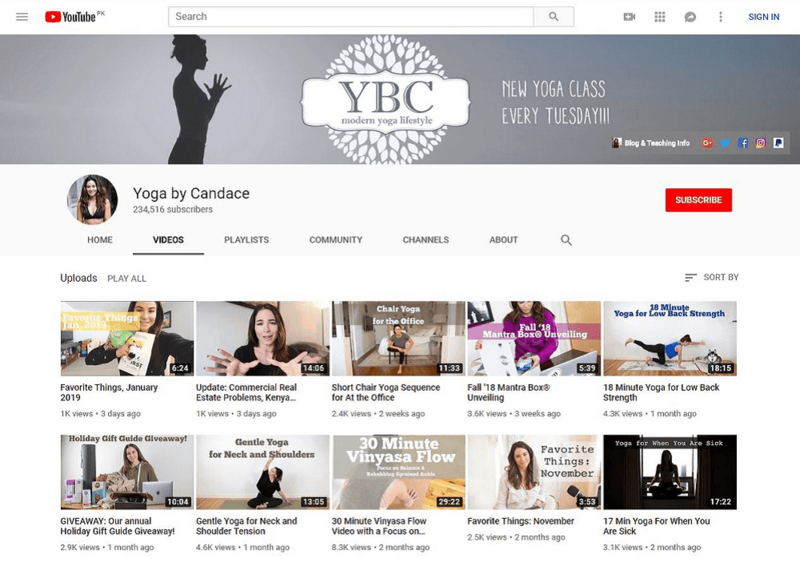 The youtuber, Candace, is equally famous for her yoga and lifestyle blog. She is an international yoga instructor who has practiced yoga all around the world. No doubt, her videos are greatly diverse and cover a wide range of topics. You can find videos with a running time as short as 15 minutes to as long as 60 minutes. The best part about Yoga By Candace is that all the content published after June 2013 is available for download. Whether you are a traveler who wants to enjoy inspiring yoga no matter where you are or simply wish to have the useful content on your phone, you can easily pdownload it and enjoy it, even when you don’t have any internet access! Tim is the ultimate yoga instructor for learning the basic principles of Vinyasa yoga. If you are wondering what that is, you may be interested to know to that Vinyasa yoga is focused on strengthening the body, improving its flexibility, and enhance your balance. In fact, it is one of the healthiest styles of yoga. Yoga With Tim makes it easy to learn all about Vinyasa yoga. However, that does not mean it’s the only thing it offers. There is a lot to learn on this channel that can help you adopt a healthy lifestyle. Kim usually uploads around 2 videos every week. So, subscribing his channel means you will always have something new to view and practice! Unlike most other exercises that are usually too hard or vigorous for children, yoga is just perfect. It is safe and easy to practice, and most children enjoy practicing it a lot. If you are looking for a new interesting hobby for your child, or simply want them to be part of your yoga regime, Cosmic Kids Yoga is the right place for you. This YouTube channel is loaded with healthy videos that are specially made for kids, helping them to relax and adopt a healthy lifestyle from an early age. Keep in mind that since all the videos are produced keeping the young audience in mind, most children find it highly engaging and joyful. Moreover, the practice sessions are tailored to meet the needs of children, which means that you can rest assured that your children are practicing safe and healthy yoga. 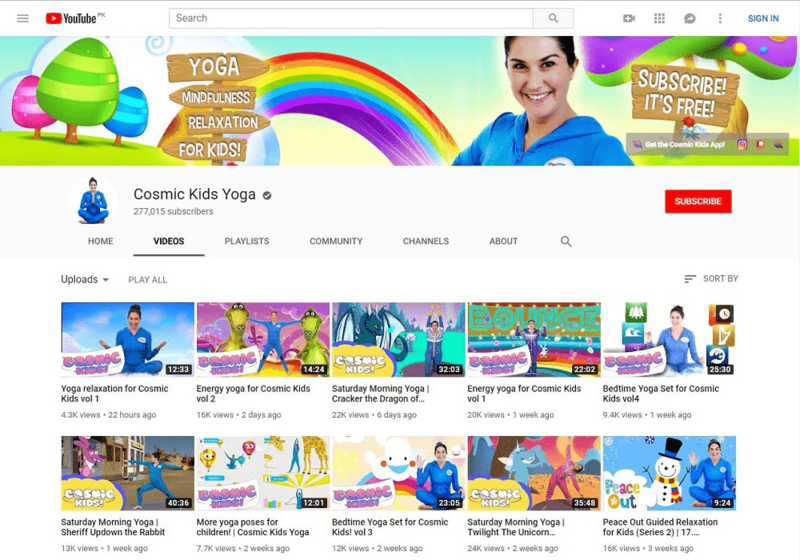 If you want to give your children a head start in life, Cosmic Kid Yoga is an excellent choice to help them learn the basic lessons of life through yoga. Sean Vigue welcomes everyone to train with him and unlock their true potential. 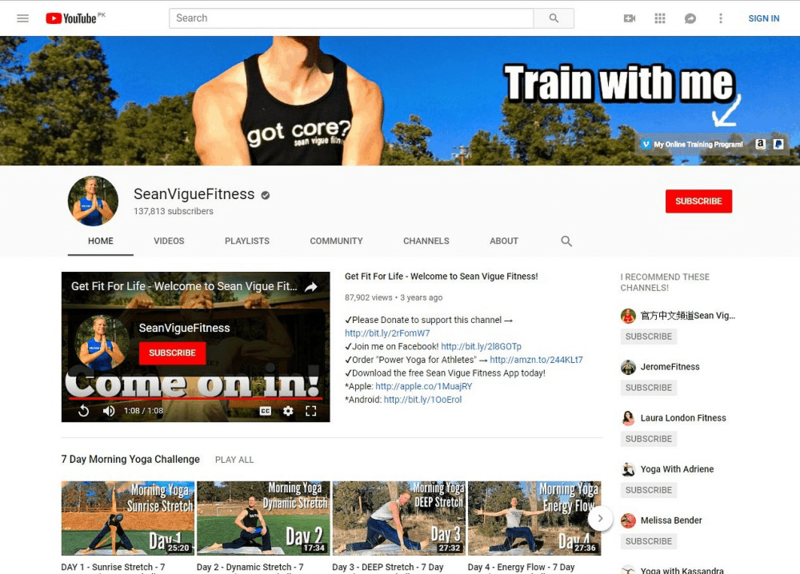 On his YouTube channel, Sean Viguel Fitness, he offers a wide collection of inspirational and instructional yoga video videos. Whether you are looking to enjoy something like Power yoga and Core yoga or want to participate in an online Boot Camp or Bodyweight and Pilates, Sean is an expert in all areas! He became part of the YouTube community in August 2009. Today, he has more than 720 videos and more than one hundred and thirty thousand followers! To take your yoga training to the next level, you can even join Sean Vigue’s online training program. It offers you a 2-week free trial, which you can cancel anytime! Yoga With Kassandra is all you need to learn all about Yin yoga. You can also enjoy weekly Vinyasa Flow classes to up your yoga game. Perhaps, the things about Yoga With Kassandra is that you can find suitable content for all experience levels. From beginners to experts, everyone can enjoy the helpful yoga videos here. Being a passionate yoga instructor, Kassandra also offers online yoga classes that allow you to learn and enjoy yoga from the comfort of your own home. From time to time, she also offers training yoga workshops! If you are looking for a truly interactive yoga learning experience, you may want to subscribe to Yoga With Kassandra. Also, don’t forget to join her Free & day Ying Yoga Immersion Program! Yoga is not just a set of exercises but a form of art. It aims to help you achieve peace and allows you to synchronize your body and mind with the cosmic rhythm. This means that movement is essential for a happy and healthy lifestyle. Keeping this in mind, Flow With Adee produce videos that help you find your movement. Keep in mind that there’s a different form of movement for everyone! For this reason, Adees yoga looks different and works differently for everyone! The goal is to let your body move you, rather than consciously dictating your every move. What makes Adee’s yoga so much fun is that it is rooted in dance. It not only enables you to find inner peace but also allows you to actually enjoy the journey. If this sound likes something that is too good to be true, keep in mind that Adee is a registered yoga teacher and has a B.S degree in Exercise Physiology. Surely, she knows what she’s doing so all you need to do is relax, enjoy your yoga practice, and let Adee guide you to a healthy lifestyle. 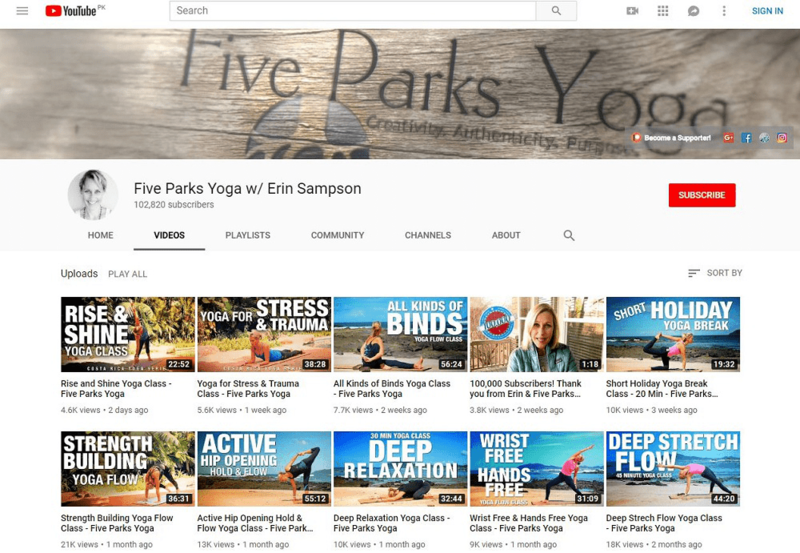 Five Park Yoga is a successful venture by Erin Sampson. She offers free yoga classes to up your yoga game. Most of her instructional yoga videos are recorded in Costa Rica and Colorado. Every Five Park Yoga video will take you on a new yoga adventure. If you are a true yogi, you are bound to enjoy the new and refreshing yoga videos by Erin. The videos are detailed and focused to provide personalized attention for every yoga practitioner. Also, there is an abundance of suitable content for practitioners of all experience levels! If you live in Costa Rica, you are in luck because Erin hosts some of the most amazing yoga retreats and workshops in Costa Rica all around the year! This provides with an opportunity to meet your yoga guru in person and practice with her in real life. Needless to say, this channel has so much going on, you will never get tired of it. While it may not be all about yoga, it is about adopting a healthy lifestyle and living your life to the fullest. Surely, you don’t want to miss out on that! 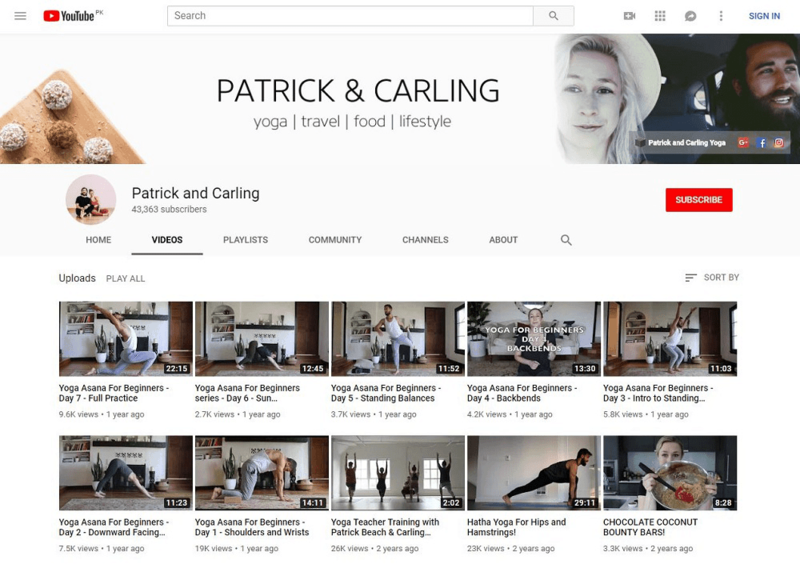 If you are looking for the perfect blend of yoga, traveling, food, and a healthy lifestyle – Patrick and Carling is where you are going to find it! 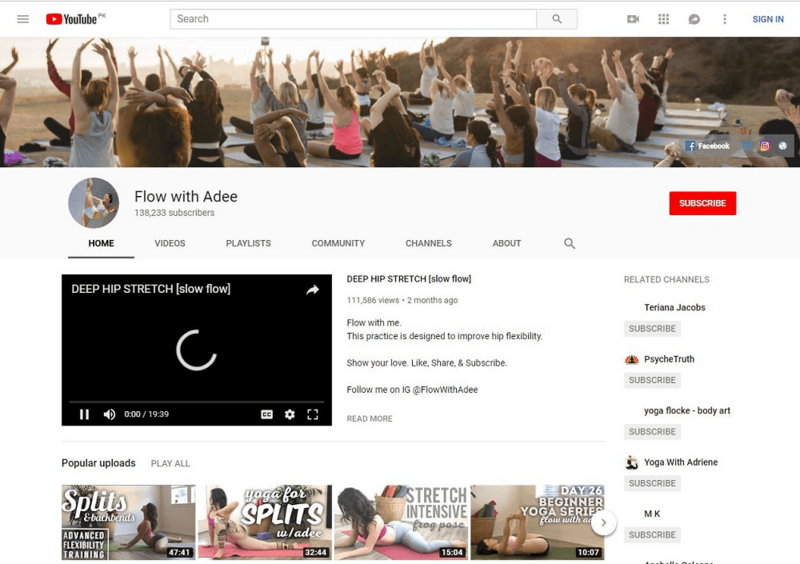 So, which of these yoga YouTube channels are you planning to subscribe to? Whether you follow them all or stick to your favorite ones, you are on your way to become an expert yogi! It’s time you unlock your true potential and discover the vast reservoir of self-love, peace, and clam in you – all through yoga! Thanks so much for including Sean Vigue Fitness in your wonderful list!